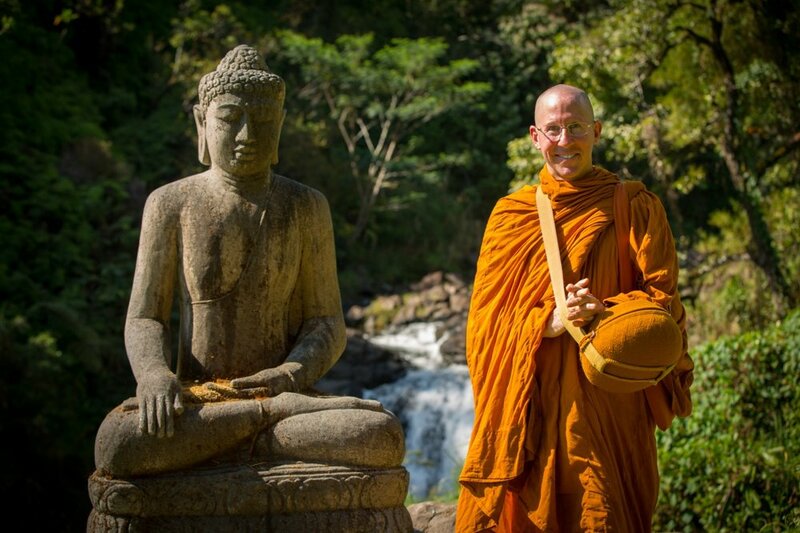 Aloha and Dharma greetings from the monk Buddhisaro here. I’ve been studying and practicing the Buddha’s teachings for 15 years now. It’s been a real learning adventure in exploring ever-deeper dimensions and potentials of the human heart & mind. Indeed transformational discoveries of liberating freedom and wellbeing await the whole-hearted aspirant. I’m happy sharing my enthusiasm with any and all likewise aspiring for liberating freedom and well-being. On February 11th, 2017, while out for a morning drive with my friend David we happened upon the Inn at Kulaniapia Falls. As synchronicity would have it, they had recently installed a large Buddha statue in their exotic bamboo garden. Amid the story telling, we were kindly escorted to view the statue. It is immediately impressing–the serene beauty of the large dark-stoned Buddha, poised as it were afront the stunning waterfalls and rugged rocky river below, guarded in sanctuary by giant bamboos. The Buddha is depicted in the beloved “Earth-Witness” mudra, representing the moment of his enlightenment. Ahhh…the peaceful presence of Buddha and awe-inspiring Nature indeed ! The Sanctuary is an altruistic safe-space for meditation and reflecting. Where all Inn guests are welcome to open, explore and awaken their whole being–to “fly-free” as it were. Communing in harmony with inner & outer nature. For deepening liberating wisdom and compassion–aspiring for the welfare of all beings ! I was happy to meet the Inn at Kulaniapia Falls community on this uplifting Buddha-Blessing occasion and participate in this way. We intend on continuing partnership to explore integrating “whole-being wellness retreat” programs into the Inn curriculum. May your experience in “Flying Buddha Sanctuary” be inspiring, joyful and peaceful ! Wishing all health, happiness and prospering–blessings please be for real well-being.